It’s that time of the year when everyone is talking about the New Year- setting resolutions, making plans and goals. 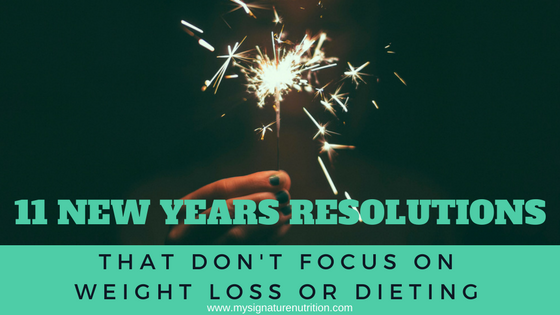 I bet you wouldn’t have to think very hard to guess what the number one new years resolution is (it makes me cringe)…of course- get healthy/weight loss/new me. I lump them all together because really they’re variations of the same idea over and over- I can be healthier and happier/ a better version of myself if I lose weight. WRONG! Here’s the truth: losing weight doesn’t make you happier, it doesn’t automatically make you healthier either and no matter what you do, you are still you. And you’re pretty awesome (even if you don’t believe it, it’s true)!! Please resist the temptation to fall into the same pattern of setting another weight loss/get healthy/new me (or other variation) goal where the end outcome is focusing on weight loss– even if you (or the person selling it) says it’s not a diet! This won’t help you feel better in the new year. It will lead you right back to where you are. 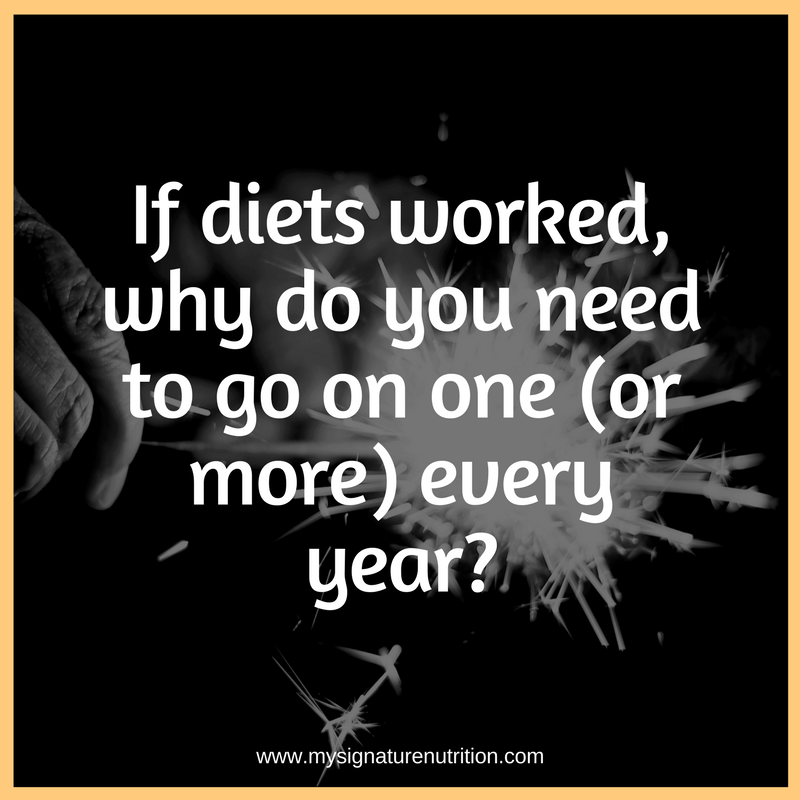 Think about it- if diets worked, why would you (and the majority of people) need to go on one (or more) every year? The reality is, they don’t work, they set you up for failure and to make you feel worse. 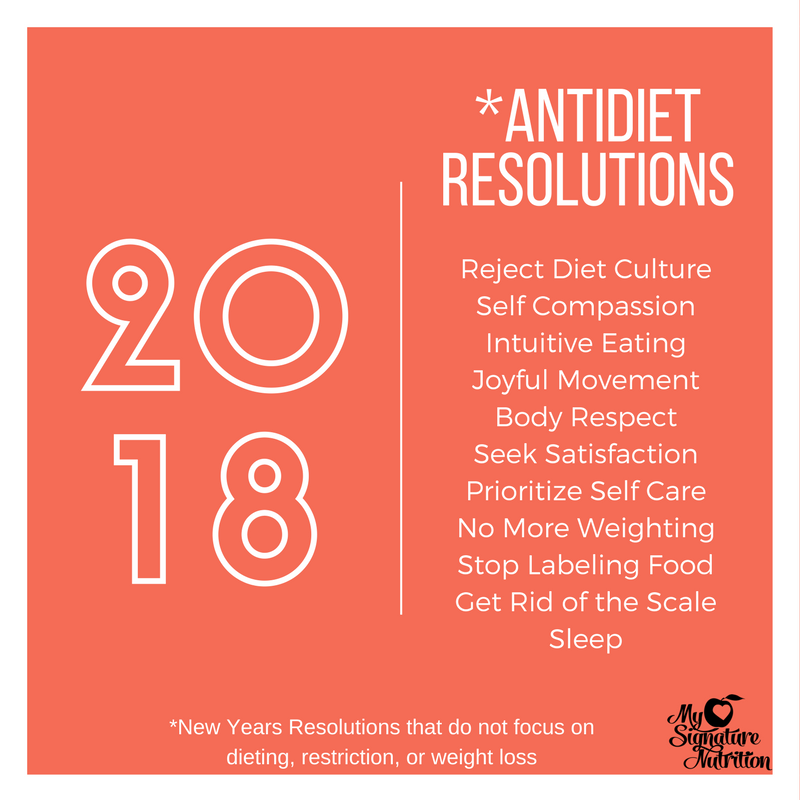 So instead of engaging in diet culture and choosing another weight loss resolution that you won’t keep, which will likely lead to weight gain, try something different! I have 11 ideas for you to consider. I hope you’ll pick one and share which one you picked! Reject Diet Culture. This one’s challenging, despite how easy it might appear. It seems like it’d be so simple just to say no to diets, dieting and all things diet related, but as you start trying your eyes open to how firmly entrenched dieting is in our culture. It’s definitely a challenge, but it also feels amazingly good. Instead of another diet- try rejecting diets and diet culture. 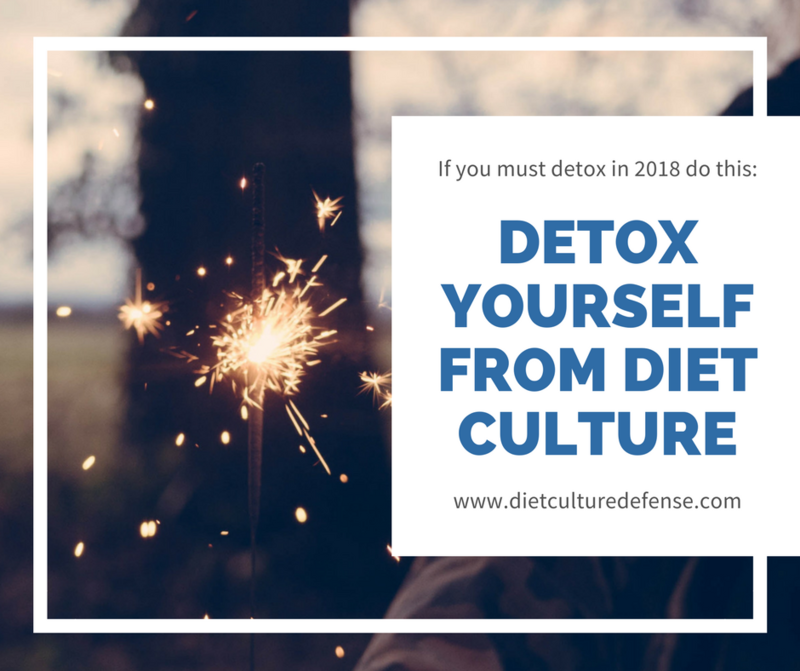 I have a free diet culture detox + 5 day mini course to get you started. It’s the only detox that I can firmly stand behind! Self Care. Self care is taking time to care for yourself. It acknowledges that you have value and worth just as you are. Sometimes with self care our culture turns more toward the materialistic version of self care where we think of getting a massage, a pedicure, spa day etc. But the reality is self care exists on a spectrum and includes anything that you enjoy doing or anything that comes back to taking care of you- basically you become a priority in your own life. The reality is self care could be taking a shower, putting on new clothes, or brushing your hair. When you’re struggling, these acts of self care are not so simple. Self care can also expand to include journaling, seeking help or support (therapy), reading, or saying NO to a new project. 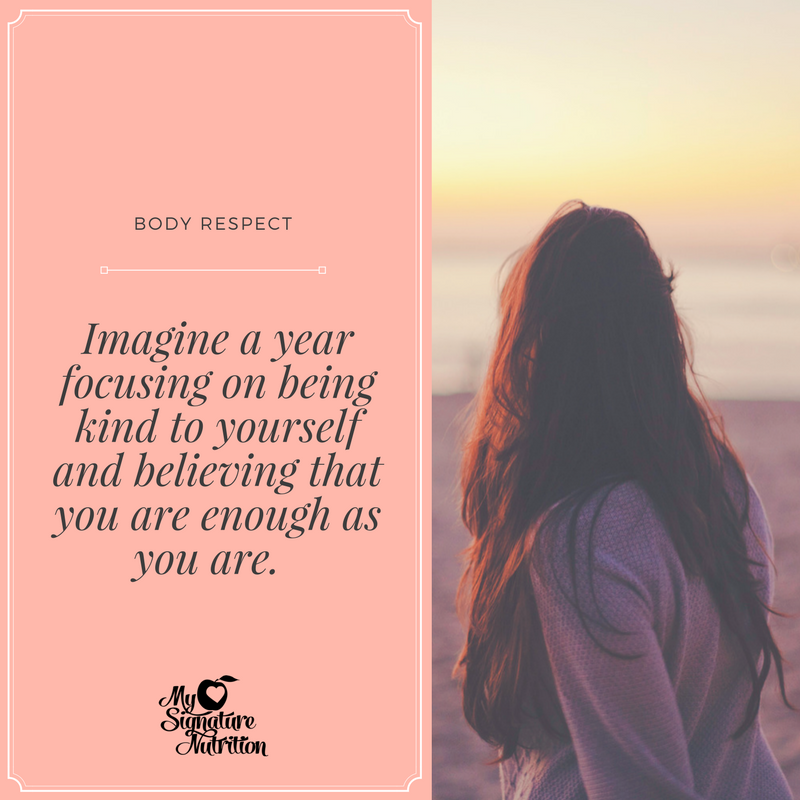 Instead of weighting (pun intended) until you’ve “earned” worthiness or feel that you’re deserving of kindness and respect, give it to yourself now. No More Weighting. This could be a form of self care as it’s taking time to do something that you desire or long to do right now. Not when you’ve earned it or have the “right body type.” Think about it like this. Make a list of all the things that you would do if you felt confident in your body. Go ahead…Now look at your list and pick one of those things to do right now. Some of the things might have nothing to do with your body- like learning a new craft- but some of them might be something that you’ve put off for years because you were weighting until you felt like you were “right” or “looked good enough” to do it. No more! Be that person now! If you want to learn to swim- go swimming. Want to hike- you just have to start somewhere. Challenge all or nothing thinking and take the first step to try something new. Discover new passions and what you really enjoy. 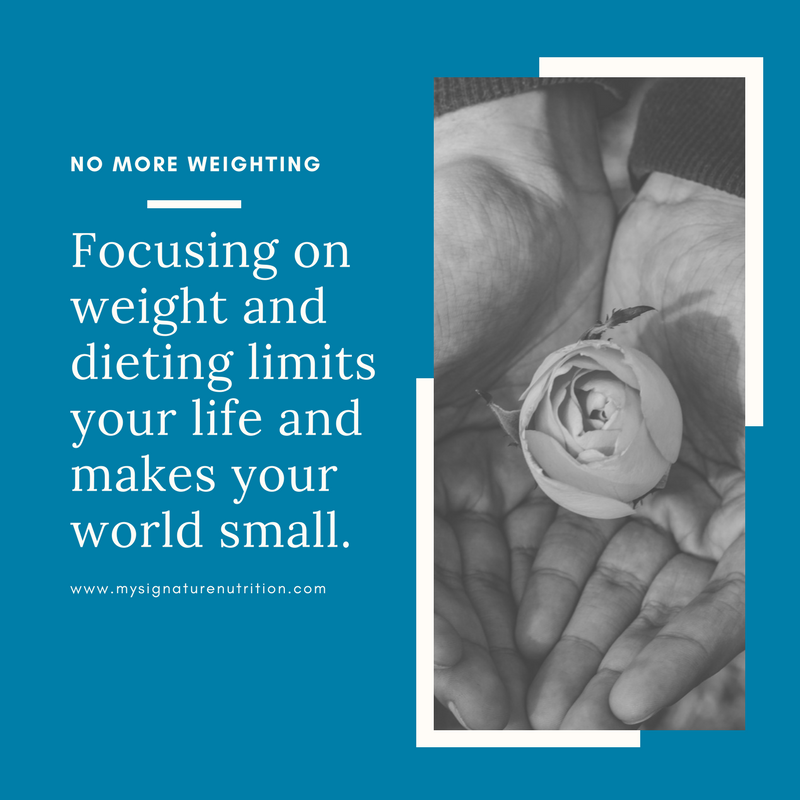 Focusing on weight and dieting limits your life and makes your world small. #NoMoreWeighting! Get Rid of the Scale/No More Weighing. Yes, you read that right- get rid of your scale. Make a commitment to focus on taking care of yourself and not the number on the scale. Therefore, get rid of it. The scale actually interferes with your ability to connect with what you need and what’s best for you. So stop, throw it out, and focus on something else. Besides, think about how much fun it will be to tell people who ask about your resolution… What’s your new years resolution- to never weigh myself again. Stop Labeling Food– another challenging resolution that appears easy on the surface. When everyone around you labels food in terms of good/bad/healthy/unhealthy/clean, etc it can be difficult to change your thinking. A step in moving away from diet culture is no longer labeling your foods with any labels that describe food in moralistic terms. It’s a challenge to change your thinking when most people around you still do this. But soo freeing and actually a huge improvement in health and well-being too! Sleep. With our busy go, go, go culture somewhere sleep fell off the list as a priority. And even more than that- there seems to be a value placed on going without sleep- of doing more with less. The reality is- sleep is really important. It impacts your mood, health, well-being and eating patterns. It’s something that doesn’t get a lot of attention, but really deserves to be well taken care of. So instead of burning the midnight oil- go to sleep. Focus on establishing sleep patterns that are supportive to you. Generally this includes going to bed and waking at the same time, turning off the tv, establishing sleep rituals, and making sleep a priority. Intuitive Eating. You probably knew this was coming somewhere on my list. Intuitive eating encompasses most everything on this list as it’s all about honoring you and your body when it comes to nourishment. It means eating for hunger and fullness, but also for pleasure and satisfaction. It includes balance but doesn’t force it. It’s about attuning to your needs and discovering what you really need. It’s letting go of the list of rules and systems that you’ve used (dieting) to feel in control and instead learning how to be fully in charge by reconnecting to your body rather than disconnecting. It’s honoring your body by NOT doing something to you a diet) but doing something with you that is supportive and fulfilling. Scary- yes, worth it- absolutely. I have some groups to support you in this process if you’re interested: Monthly Intuitive Eating Group and 10 Week Intuitive Eating group. Individual support is also available. What will you choose? Share with me below! « If You Wouldn’t Do These 8 Things…Why Are You Still Dieting?